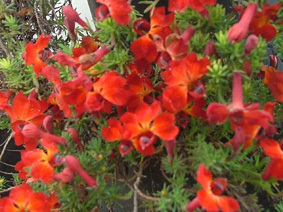 Prostrate plant, grey green foliage, orange red flowers winter-spring. Spreading succulent, violet - purple flowers, Spring - Autumn. Prostrate groundcover, rounded succulent leaves, purple flowers spring-summer. Small prostrate succulent, purple flowers, Spring - Autumn. Erect tufted plant with stap-like leaves, white flowers with yellow centres late spring-summer. Low spreading shrub, grey leaves, yellow flowers in spring. Small compact weeping shrub, yellow flowers in spring. 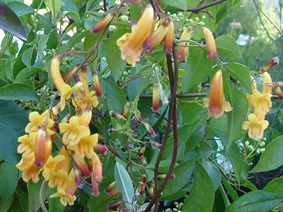 Showy climber, light green leaves with clusters of open orange flowers during September - November. Small plant with woolly silvery leaves, flower stem to 80cm with yellow rounded heads in spring - summer. 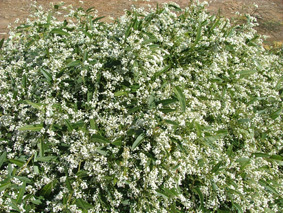 Low spreading shrub, profuse small white flowers ageing to red during September - November. Long leafy leaves, bright blue flowers above foliage September - November. 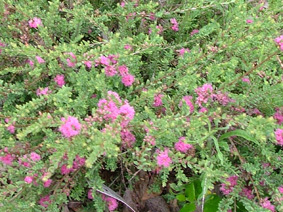 Small open shrub, light green foliage, blue, lilac, and pale pink star like flowers spring - summer. Grey strap like leaves, yellow flower clusters above foliage, August - November. Linear green leaves, with yellow star flowers along stem during spring. Small lily, green linear leaves, stem of yellow flowers spring - early summer. Compact shrub, bright green leaves. 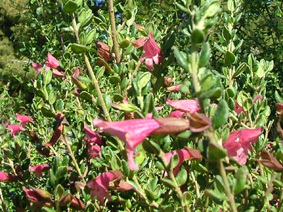 Spreading shrub, dark green wrinkled leaves, pale pink flowers spring. Dark green shiny leaves small greenish flowers spring. 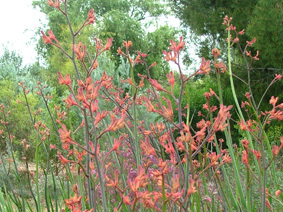 Tall plant with Red-rusty flowers to 1.2m above foliage. 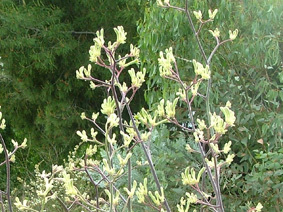 Tall plant with green-yellow flowers to 1.2m above foliage. Tall plant with bright yellow flowers to 1.2m above foliage. Orange flowers to 1.2m above foliage. Red flowers to 1.2m above foliage. Bright orange flower spikes to 1m above foliage, spring - summer. Prostrate creeping shrub, reddish brown flower spikes September - November. Variable upright shrub, brilliant red flowers in spring. Prostrate creeping shrub, brown-orange flower spikes September - December. 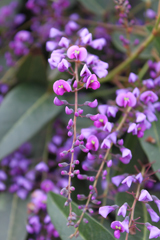 Low spreading plant to 30cm, soft green toothed shaped foliage, mauve-pink flowers spring-summer. Low spreading plant to 30cm, soft green-grey foliage, dark blue flowers spring-summer. Hardy low spreading plant to 50cm, soft green foliage, blue flowers spring-summer. Upright compact plant, soft green foliage, light blue flowers spring-summer. Low spreading plant to 50cm, soft green foliage, pale pink flowers spring-summer. 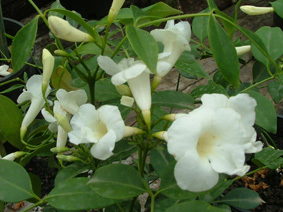 Low spreading plant to 50cm, soft green foliage, white flowers spring-summer. Local species, prostrate spreading plant, grey foliage. Local species, low spreading shrub, grey foliage, yellow-red fruits. 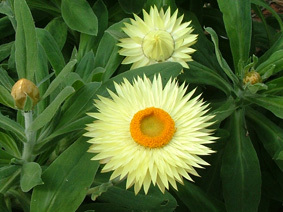 Low plant, silver-grey foliage, bright yellow flowers heads spring-summer. Prostrate spreading plant, yellow flowers autumn-spring. Prostrate spreading plant , soft green foliage, pink flowers spring - summer,. Upright plant, with purple - maroon new leaves, good feature plant. Small shrub, orange flowers winter. Small shrub, pink flowers autumn-winter. Small erect shrub, grey foliage, blue flowers spring-summer. Low growing shrub, purple - blue flowers spring - summer. Prostrate form, white flowers spring - summer, part shade - full sun. 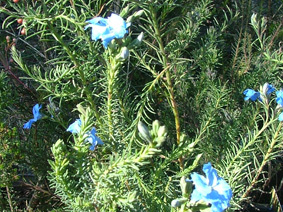 Flax-like leaves, blue flowers followed by bright blue berries in spring. Sword-like leaves, red flower spike to 6m spring-summer. Large green leaves, red flowers borne on stem to 3 metres. 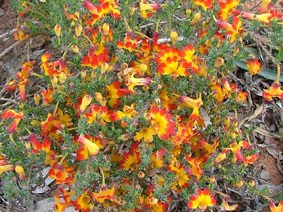 Low spreading groundcover, light green foliage, orange flowers. Full sun. Low spreading shrub, light green foliage, yellow-green flowers. Spreading prostrate shrub, green leaves, yellow-orange flowers spring-autumn. Small shrub, narrow leaves, blue - purle flowers winter - spring. Low spreading groundcover, dark green foliage, orange flowers. Full sun. 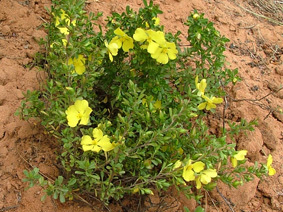 Small compact shrub, yellow and red flowers in spring, most soils. Erect tufted perennial grass, attractive-seed heads up to 1m in spring. Tuffed perennial grass, with feathery flower heads in spring. Perennial grass, bluish leaves, attactive seed heads above foliage during spring-summer. Full sun. Erect tussock forming grass, feathery purplish flower heads above the leaves. Weeping tussock forming grass, greyish leaves, flower heads above the leaves. 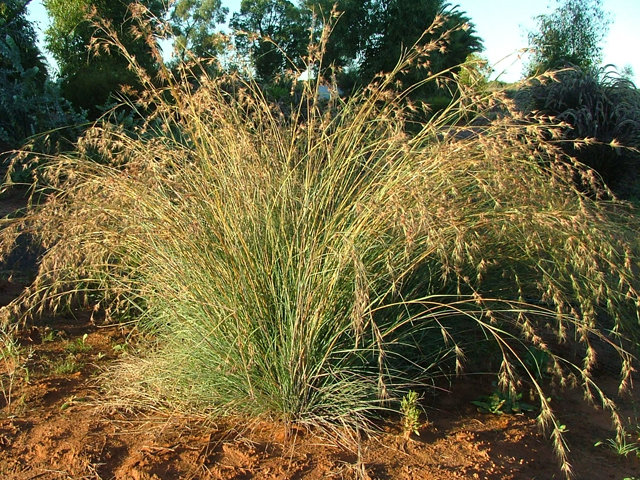 Erect tussock forming grass, (blue foliage form) flower heads above the leaves. Prostrate spreading plant, red-purple flowers. Low spreading plant to 2m across, bright green foliage, large golden brush flowers, late summer - winter. Prostrate trailing shrub, red-purple flowers autumn-spring. Spreading shrub, clusters of red and yellow flowers autumn-spring. Prostrate plant, dense foliage, red flowers spring. Prostrate form, bluish green leaves, pale yellow flowers above the foliage winter. Twining climber, moderately vigorous with trifolioate leaves, purple flowers in spring. Small spreading plant, yellow flowers through spring and summer. Small compact plant, yellow flowers spring-summer. Vigorous climber, dark green leaves, dull red pea-flowers. Low spreading shrub, fragrant white flowers in spring. Straggling small shrub, light blue flowers spring. Straggling small shrub, dark blue flowers spring. Low spreading shrub, red flowers autumn-spring. Low growing form, good ground cover, pale pink flowers autumn - winter. Small clumping plant, light green foliage, border plant. Small compact plant, light green foliage, pale yellow flowers winter - spring. Dense fine weeping lime-green foliage, light yellow flowers spring - summer. Large tufted plant, bright green leaves. Medium plant, light green foliage. Low spreading shrub, red-rusty flowers, spring. 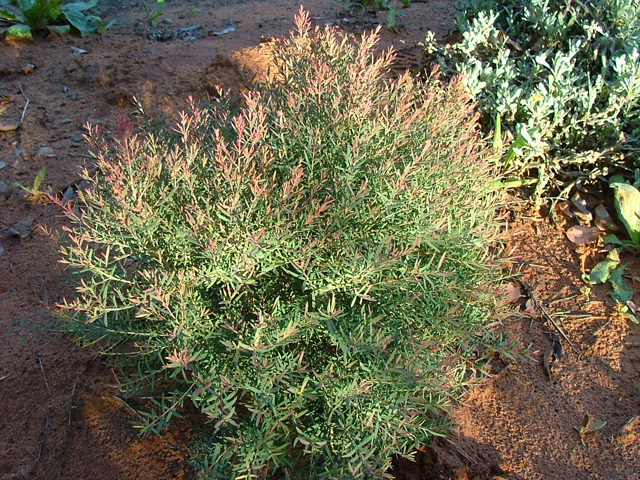 Dwarf form, reddish new foliage, white flowers, late spring-summer. Low spreading shrub, bright pink flowers, spring-summer. Low spreading shrub, pale pink flowers, summer. Small shrub, white flowers, spring-summer. Prostrate spreading plant, purplish leaves, white flowers in spring. 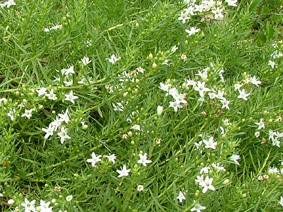 Prostrate spreading plant, fine narrow leaves, masses of white flowers in spring. Prostrate spreading plant, pale pink flowers in spring. 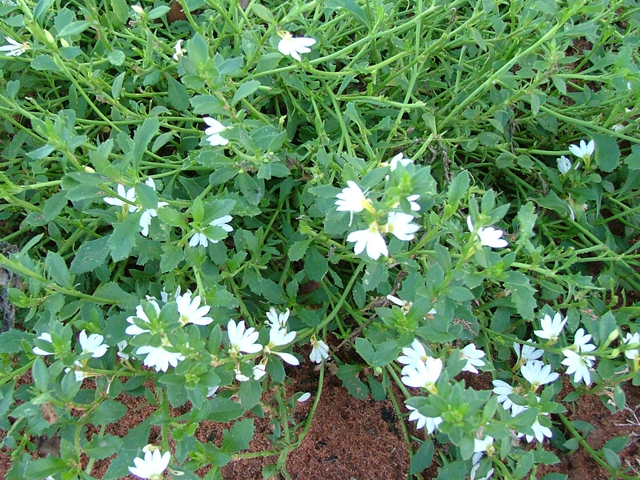 Prostrate spreading plant, white flowers in spring. Clumped plant with grass like leaves blue flowers with stem to 80cm in spring. Flat leaves with violet-purple flowers, spring - summer. Clumped plant, white flowers spring - early summer. 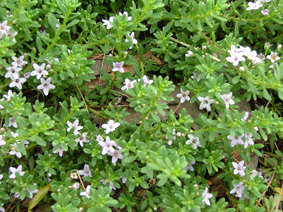 Small shrub, green heath like leaves, profuse blue-mauve flowers in spring. Small compact shrub, light red flowers August - November.. Spreading plant, grey-green foliage, white flowers with orange centres spring-summer. Small spreading plant to 40cm, light blue flowers mainly spring-summer. 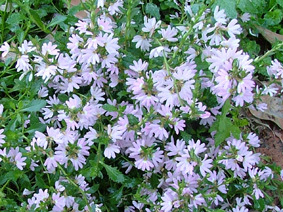 Small spreading plant to 40cm, pale pink flowers mainly through spring and summer. 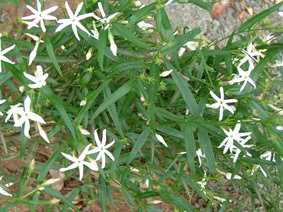 Small spreading plant to 40cm, white flowers mainly spring-summer. Small spreading plant to 40cm, violet flowers mainly spring-summer. Small compact plant, blue-mauve flowers, spring-autumn. Local species, trailing plant to 1-2m across, grey-green leaves, brilliant re and black flowers spring - summer..
Small shrub, large pea-flowers mauve-pink flowers spring-summer. Small spreading shrub, profuse pink flowers winter - spring. Small spreading shrub, masses small deep pink flowers winter - spring. low spreading shrub, deep pink flowers during winter. Light green round-kidney shaped leaves, white and purple flowers most of the year. Light green round-kidney shaped leaves, light blue flowers most of the year. Light green round-kidney shaped leaves, white flowers most of the year. Large bright yellow everlasting flowers, grey leaves,spring - autumn. 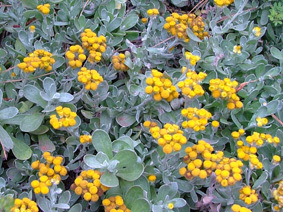 Spreading plant, grey leaves, large pale yellow/lemon everlasting flowers throughout the year..